A debt schedule lays out all of the debt a business has in a schedule based on its maturity, usually used by businesses to construct a cash flow analysis. As shown in the graphic below, interest expense in the debt schedule flows into the income statementIncome StatementThe Income Statement (or Statement of Profit and Loss) shows performance from operations of a business. The financial statement begins with revenues and, the closing debt balance flows onto the balance sheetBalance SheetThe balance sheet is one of the three fundamental financial statements. These statements are key to both financial modeling and accounting. The balance sheet displays the company’s total assets, and how these assets are financed, through either debt or equity. Assets = Liabilities + Equity, and principal repayments flow through the cash flow statementCash Flow Statement​A Cash Flow Statement (officially called the Statement of Cash Flows) contains information on how much cash a company has generated and used during a given period. It contains 3 sections: cash from operations, cash from investing and cash from financing. (financing activities). The debt schedule is one of the supporting schedules that ties together the three financial statements.Three Financial StatementsThe three financial statements are the income statement, the balance sheet, and the statement of cash flows. These three core statements are intricately linked to each other and this guide will explain how they all fit together. By following the steps below you'll be able to connect the three statements on your own. The interest expense calculated above (row 258) flows onto the income statement as interest expense. The closing balance (row 256) flows onto the balance sheet as the total debt value under liabilities. In this example, interest expense is based off a fixed interest rate multiplied by the average debt balance for the period (opening plus closing divided by two). The example above is from CFI’s LBO Financial Modeling Course. When building a financial modelWhat is a Financial Model?A financial model is a representation of a company’s past and future performance based on it's assets & operations. 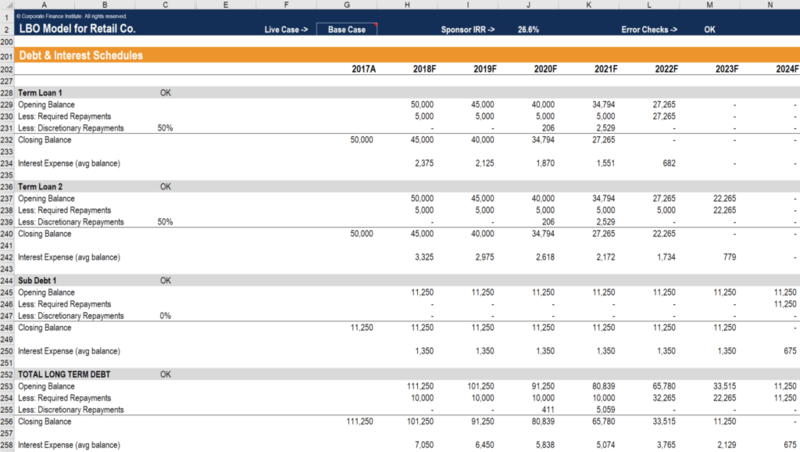 Find out: what is a financial model?, an analyst will almost always have to build a supporting schedule in Excel that outlines debt an interest. The above items allow the debt to be tracked until maturity. The closing balance from the schedule flows back to the balance sheetBalance SheetThe balance sheet is one of the three fundamental financial statements. These statements are key to both financial modeling and accounting. The balance sheet displays the company’s total assets, and how these assets are financed, through either debt or equity. Assets = Liabilities + Equity, and the interest expense flows to the income statementProjecting Income Statement Line ItemsWe discuss the different methods of projecting income statement line items. Projecting income statement line items begins with sales revenue, then cost of goods sold, gross profit, selling general and admin (SG&A), depreciation, amortization, taxes, EBITDA, and net income. This guide has examples. DebenturesDebentureA Debenture is an unsecured debt or bonds that repay a specified amount of money plus interest to the bondholders at maturity. A debenture is a long-term debt instrument issued by corporations and governments to secure fresh funds or capital. Coupons or interest rates are offered as compensation to the lender. Debt maturity – most debt is amortized and paid monthly. The longer the maturity of the debt, the lower the amount due monthly, yet the higher the total sum of the debt and interest accrued. Interest rate Simple InterestSimple interest formula, definition and example. Simple interest is a calculation of interest that doesn't take into account the effect of compounding. In many cases, interest compounds with each designated period of a loan, but in the case of simple interest, it does not.– The lower the interest rate, the better, but not always. A low-interest rate for a long-term debt usually results in higher interest than short-term debt with the high-interest rate. The investor needs to calculate the total interest. Floating or fixed interest – A floating interest rate will change the overall debt amount each year, while a fixed interest rate provides reliability in the calculation. Depending on the future assumption; a floating interest rate is the better choice in a low or declining interest rate environment. Ability to generate gain – No reason to take on new debt if the debtor cannot generate a steady stream of income to pay the debt off. Failure to pay a debt might result in forced liquidation and a loss of trust. The ability to estimate the total amount a company needs to pay once a debt matures is the main reason a debt schedule is made. Another reason for using a debt schedule includes the company’s ability to monitor the maturity of the debt and make decisions based on it, such as the possibility of refinancing the debt through a different institution/ source when the interest-rate declines. The debt schedule report can be used as an instrument to negotiate a new line of credit for the company. Lenders will use the report and consider the risk/rewardRisk Averse DefinitionThe risk averse definition the characteristic or trait of avoiding risk. This characteristic is usually attached to investors who prefer lower returns to before granting new credit. Debt-to-Equity RatioDebt to Equity RatioThe Debt to Equity Ratio (also called the "debt-equity ratio", "risk ratio" or "gearing"), is a leverage ratio that calculates the value of total debt and financial liabilities against the total shareholder’s equity.